This property is directly associated with the early twentieth century era (1920-1930) when the modern downtown commercial district was fully established as additional high-rise commercial buildings were built. The economic prosperity of the 1920s stimulated the development of numerous major high-rise commercial buildings, as well as smaller-scale bank and specialty retail stores, major hotels including apartment hotels, club buildings and entertainment facilities designed by leading local architects. During this era, the northward expansion and establishment of the commercial development lead to the destruction of the original residential district, which was absorbed by commercial and other real estate development. By 1930, virtually all of the old residential district properties - as well as many of the immediate post-fire era commercial buildings outside of Pioneer Square - had been demolished or removed. The concept of the modern hotel that would include private rooms, toilet and bathing facilities, public spaces and related guest services, originated in the early nineteenth century. By 1853, the settlement community of Seattle included its first hotel, the Felker House. By the later part of the nineteenth century, Seattle - like cities throughout the United States - included a significant number of hotels that served a wide variety of business travelers, tourists and both permanent and semi-permanent residents. By the late 1880s several elegant hotels as well as workingmen’s hotels were clustered along the west side of First Avenue between Cherry and Columbia – in proximity to the original railway passenger depot. Urban hotels, lodging and apartment buildings all closely resembled commercial office buildings in the 1880s and 1890s; it was not until the 1920s that hotel design became distinctly different in exterior appearance. Early hotel development was clearly stimulated by improvements in railroad service that brought immigrants and drew tourists and entrepreneurs. Prior to the fire of 1889, the Occidental – Seattle Hotel (1864, 1887 & 1889, destroyed), was the city’s premier tourist-oriented hotel, although there were numerous other hotels located within the commercial district. At least a dozen hotels were destroyed in the great fire of 1889; however, within four years some 63 hotels were in operation. After the fire, both the Rainier Hotel (1889, destroyed) between Columbia and Marion Streets above Fifth Avenue and the Rainier-Grand Hotel (c.1889, destroyed) at First Avenue and Marion Street functioned as the major tourist hotels. The Rainier had been intended initially to serve as a resort hotel, as was The Denny Hotel (1890-1892, destroyed). Both were large wood-frame buildings located above the commercial and residential districts with panoramic views out to the harbor. Other major post-fire tourist-oriented hotels included the Butler Hotel (1893, partly destroyed) and the Lincoln Hotel (1900, destroyed by fire in 1920) at Fourth Avenue and Madison Street. The Lincoln was promoted as an elegant residential hotel with family-style living quarters. By the turn of the century, tourist and residential hotels lined the west side of First Avenue to Pike Street. Based on the number of hotels that were operating in Seattle by 1900, it is certain that they mostly catered to long-term residents rather than temporary visitors. Many buildings that were identified as hotels actually functioned as lodging houses or apartment hotels. During the late nineteenth and early twentieth centuries, hotel living was particularly common especially in the developing cities of the American West. Hotels varied significantly in size and accommodations provided and served every economic level from those of wealth to recent immigrants and transient salesmen and laborers. Given the tremendous population growth in Seattle after 1902, hotels and lodging houses played an important role in absorbing a new and largely transient populous. While large resort or tourist-oriented hotels like the Rainier-Grande Hotel and the Denny Hotel are noteworthy, the great majority of hotel buildings built after 1900 and prior to the 1920s were much more modest operations. A particularly significance boom in hotel development occurred between 1906 and 1910 in conjunction with local economic opportunities and population growth as well as the opening of the Alaska-Yukon-Pacific (AYP) Exposition of 1909 that drew some 3.7 million visitors. By 1910, Polk’s Directory included over 475 hotel listings. Family-style hotels were designed to include suites of rooms that would be used by individuals who needed especially comfortable long-term accommodations for their relocated families or those who traveled regularly but maintained a principal residence elsewhere. Apartment hotels differed from apartment living in that regular household help and meals were provided as part of the hotel services. During the 1920s, a second boom in major hotel development occurred at which time several luxury hotels and large apartment hotels were built in the downtown commercial district. They contrasted with earlier hotels that were rarely taller than six-stories; like their neighboring office buildings, these new hotels were significantly larger and taller multi-story buildings that accommodated hundreds of guest rooms. Several were designed to include kitchen facilities and promoted for both hotel and apartment hotel purposes, including: the Spring Apartment Hotel (Kennedy, Vintage Park, 1922); Claremont Apartment Hotel (Hotel Andre, 1925); and Camlin Apartment Hotel (1926). The construction of the highly luxurious Olympic Hotel at a pivotal central location in the Metropolitan Tract in 1923 appears to have spurred other major hotel construction nearby, including: the Continental Hotel (Hotel Seattle, 1926) and the Hungerford Hotel (Pacific Plaza, 1928). Simultaneously, numerous hotels were developed nearer the new retail core at the north end of the commercial district, including: the Vance Hotel (1926); the Benjamin Franklin Hotel (1928, destroyed) and the Bergonian Hotel (Mayflower Park Hotel, 1927). The design for most – but not all – of these hotels included large lobbies, restaurants, meeting rooms, and storefront level retail spaces. They were typically executed in a modest neoclassical mode with brick cladding and distinctive terra cotta ornament at the base and building cap. The 17-story Roosevelt Hotel, designed in the distinctive Art Deco style was completed in 1930. It was the last major downtown hotel constructed during this era and the tallest to be built until the late 1960s. In 1969, the 13-story Benjamin-Franklin Hotel was interconnected to a new 40-story tower wing and renamed the Washington Plaza Hotel. In 1980, the Benjamin Franklin Hotel was demolished in order to construct a second (44-story) tower wing, now known as the Westin Hotel. The Bergonian Hotel was formally opened to the public on July 16, 1927. The 240 room tourist-oriented hotel was constructed at a cost of $750,000 for Stephen Berg and named in his honor. Mr. Berg was a successful local real estate developer who developed, owned and operated the hotel until 1933. Its original interior included luxurious lobby furniture and appointments, oriental rugs and chandeliers. A large dining salon was located at basement level and a club dining room off of the mezzanine lobby. A coffee shop was also located in the hotel. The upper four floor levels were reported to be configured to serve as apartments and several rooms were “reserved as permanent residences.” The storefront level at Fourth Avenue was originally configured to include three separate retail spaces with recessed entryways. Stephen Berg was born in Norway where he was trained in the carpenter’s trade from his father. He immigrated to the United States in 1905 where he settled in Boston for a short while before migrating to Seattle. In 1909, after having worked for others, he established his own contracting business. He received his naturalization papers in 1913. By 1916, berg was credited with having built and sold some 125 buildings – primarily family homes. By then he was a member of the Seattle Real Estate Association and held numerous improved and unimproved pieces of real estate. By 1927, Berg is reported to have developed seven large buildings downtown and was referred to in the local press as a “pioneer uptown hotel builder” possibly in reference to the nearby Claremont Apartment Hotel that he developed in 1925 and the Continental Hotel (1926). Berg continued to be listed as a contractor in city directories until 1934, after which he is no longer listed. The Bergonian Hotel was rescued from foreclosure in 1933 by the Fourth-Olive Corporation. In 1934 the hotel building was remodeled and its name was changed to Mayflower Hotel. By 1937 and for many years thereafter a large double-faced “Mayflower Hotel” neon sign was located on the rooftop and a Bartell Drug Store and Fidelity Savings bank occupied the 4th Avenue storefronts. By the 1950s, these storefronts had been extensively altered and enclosed in order to convert the spaces to a cocktail lounge, known as the Carousel Room. By the early 1970s the hotel had declined into a fairly “seedy’ operation. A major renovation effort was undertaken in 1974-76 with improvements designed by Bassetti & Company. The hotel was renamed once again as the Mayflower Park Hotel, to strengthen its physical relation to the redevelopment of nearby Westlake Plaza and the proposed new Westlake Park. In addition to upgrading all of the guestrooms and renovating the hotel lobbies, the old Carousel Room was transformed into Oliver’s cocktail lounge - a daylight bar. It was the first cocktail lounge in the state to be day-lit with a wide expanse of windows open to the street. State regulations imposed by the State Liquor Board had until then prohibited minors from viewing the preparation of drinks so all such establishments were typically walled off from the street - in this case by the removal of original storefront display windows and transoms. A change in regulations allowed for the storefront level to be reopened and the fenestration partially restored. Bertram Dudley Stuart (1885-1977) practiced in Seattle after 1918 and in partnership with Arthur Wheatley from 1925-1930. Mr. Stuart and the firm are credited with the design of numerous apartment houses and hotels, including; Exeter Apartments House (1927); Marlborough Apartments (1926-27); and Earl Hotel (1926). Stuart and Wheatley are also known to have designed the Biltmore Apartments and the nearby Claremont Apartment Hotel (1925) for Stephen Berg. Stuart was in partnership with Robert Durham for 1941-77. He founded the Craftsmen Guild of Washington in 1939 and served as secretary-treasurer until 1956. Despite some storefront level alterations this is a well-preserved example of an important downtown property type, a tourist-oriented hotel. The Bergonian Hotel is a noteworthy example of hotel design from this era and was designed by the notable architectural partnership of Stuart and Wheatley for an influential hotel developer of the era. Prominently located on the SE corner of Olive Way and Fourth Avenue this 12-story hotel building was designed to include 211 guest rooms and measures 70’x 108 ft. It exhibits a three-part vertical block façade composition, distinctive terra cotta materials and details, and understated architectural elements and ornament drawn from the Italian Renaissance. The reinforced concrete structure includes a concrete foundation and basement. It is clad with buff-pink glazed terra cotta brick at the shaft and cap. Grooved cream color (with pink and beige speckles) terra cotta panels, terra cotta pineapple keystones and intermediate cornice with meander ornament also accentuate the building base. Grey granite and polished greenish-black color marble further accentuate the bulkhead at the base of the building. Terra cotta window surrounds and a watertable cap at the second floor level also accentuate the building base. The building cap is accentuated by terra cotta banding at the tenth and eleventh floor levels and above the 12th floor level windows and by ornate window surrounds, spandrels and arched heads at the corner windows on the upper two floor levels. All of the 1/1 double–hung wood windows are set in individual openings across the two principal elevations with exception of paired windows that extend the full height of the building at the center of the Olive Way (north) elevation. The top of this wide central window bay terminates at the building cap with an arched header that is surmounted by classical terra cotta ornament including swag and cartouche design elements and a stepped parapet wall. The building cap is further articulated at both elevations by terra cotta plaques that correspond with the typical window bays, terra cotta coping and a narrow balcony element and stepped parapet treatment at each corner bay. The central window bay on the Olive Way elevation corresponds with a formal arched entry portal at the base. The entry vestibule is distinguished by several features including; a wide lunette window, a vaulted and coffered ceiling, a classical polychromatic decorative frieze and pink marble door surround trim. Mezzanine and storefront level windows are multi-pane and appear to be original or reconstructed to match original. Exterior alterations are limited to the introduction of a modern canopy at the entry portal and awnings along the west side of the building base where an expanded second hotel entryway now exists. Significant intact public spaces include the lower and upper lobby areas. The lobbies are interconnected by an open stairwell and distinguished by a decorative beamed ceiling and wrought iron handrails. 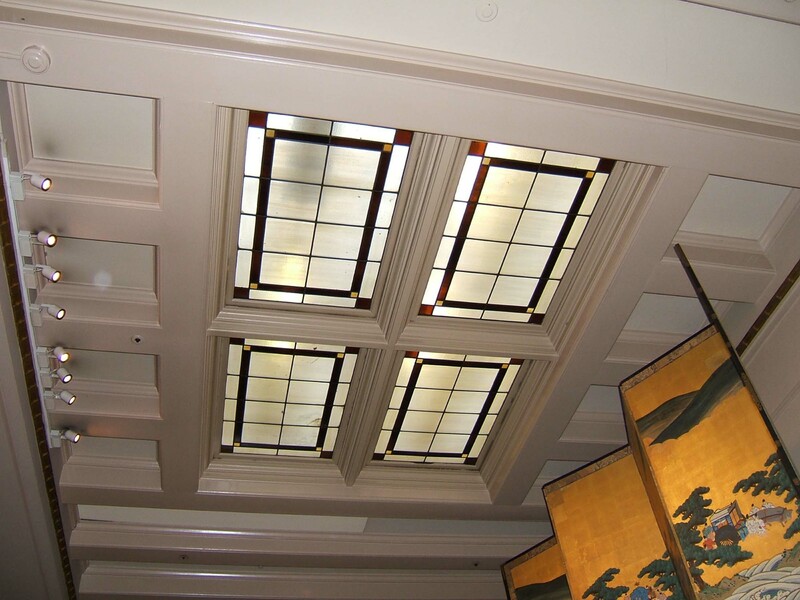 The lower lobby includes two stained glass skylights located over the reception desk, which appear to be original interior features. The upper lobby includes an original fireplace with ornate wooden surround and over-mantel that is flanked by leaded and stained glass windows with fleur-de-lys and a “B” inscription indicative of the original hotel name, Bergonian. "Bergonian Hotel is Opened" Seattle Times, July 17, 1927.